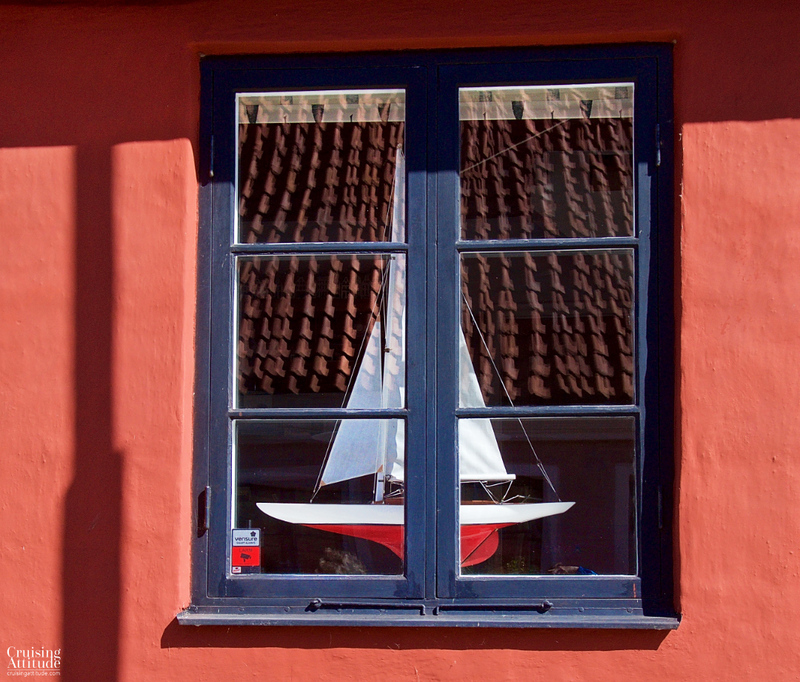 We got off to an early start — 8.15- – from Ystad. 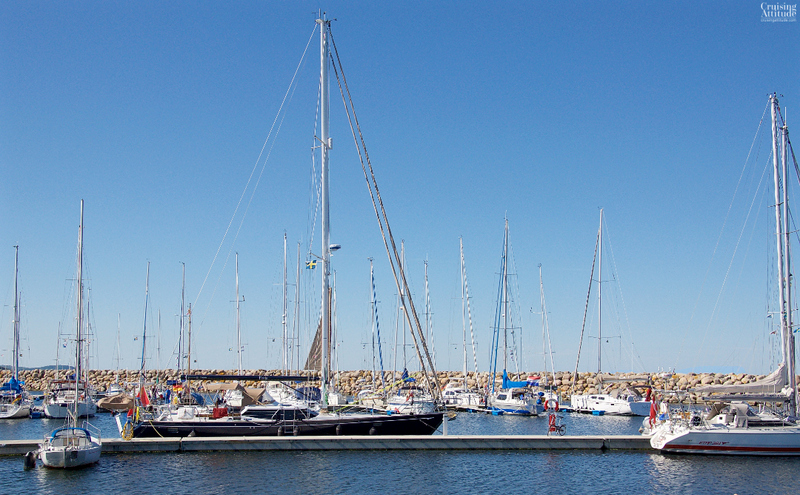 Our goal was to arrive at Simrishamn, another marina that doesn’t have many places for larger boats. We wanted to arrive by 15.00 at the very latest. Fortunately, we had wind blowing from the right direction at between 12-16 knots. Enough to cross the 33 nautical miles before the crowds arrived. 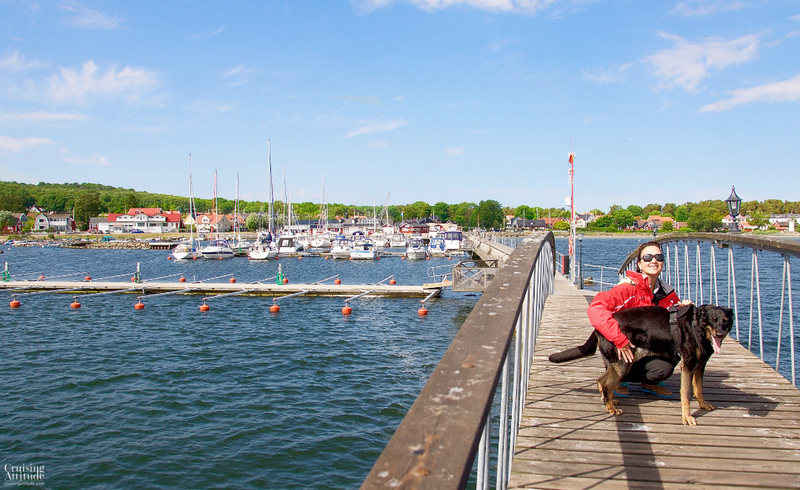 The marina in Simrishamn is a bit unusual in that you need to read the signs indicating the depth in each part of the marina. Closest to land it’s 1 meter, then a sign states 1,6 meters, then 2 meters, etc. If you just go for a vacant berth without reading the signs, you could go aground. Luckily, we arrived just after 15.00. The crowds (mostly German and Danish boats) began coming in at 16.00. You may be thinking, “why all the worry about getting a berth – why don’t you just raft up to another boat”. Well, its mostly because of the dog. 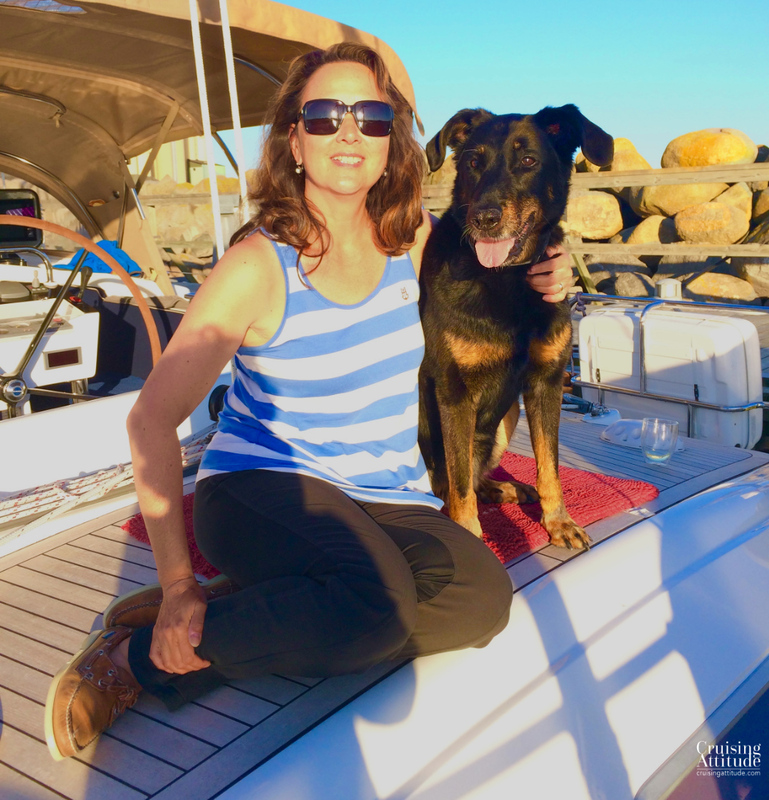 We don’t think our old dog would be able to jump onto another boat, since most boats either don’t have a mid-ship gate or would leave it up (this is happened to us). 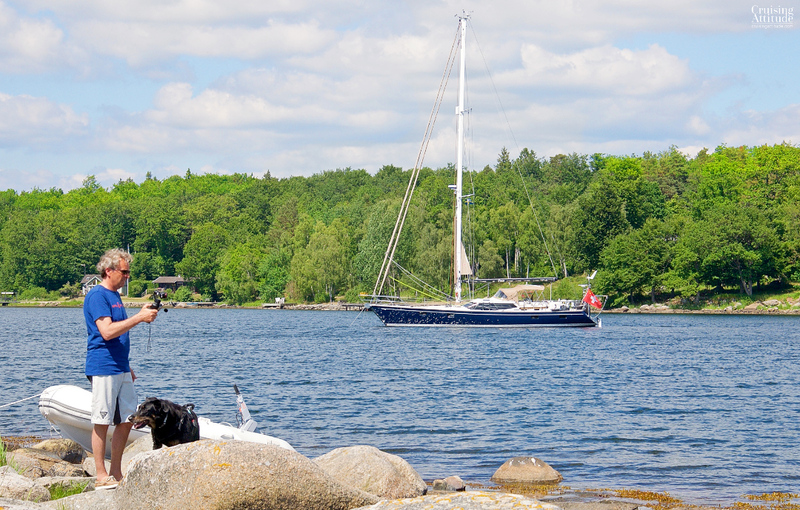 You also can’t be sure that the boat being rafted is dog-friendly. They could be allergic — or have a cat onboard! The final reason is that the average size boat in Scandinavia is perhaps 40 feet and weighs 10 tonnes. Freja weighs 27 tonnes fully tanked, so her size and the displacement scare most other boat owners – and they’ve flat out said no, you can’t reef up to us. The only boat that ever said “OK, but we need to leave early tomorrow morning” was a Westerly 49 when we were in the Bristol Marina. 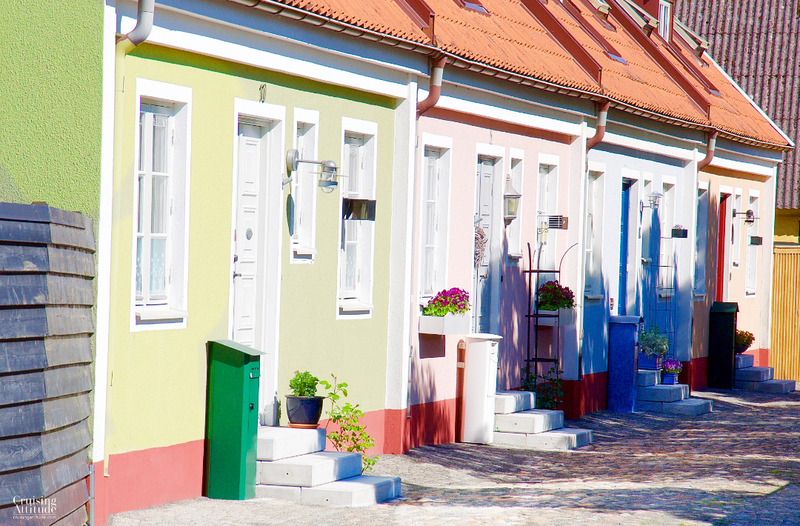 Simrishamn is a colourful, picturesque coastal town that becomes a popular summer resort town in the summer. The beautiful white sand beaches in the area between Ystad and Kivik, just north of Simrishamn, attract thousands on tourist each year. This area is called Österlen. The centre of town begins at the fishing harbour. From there you’ll find a pedestrian street lined with shops and restaurants. 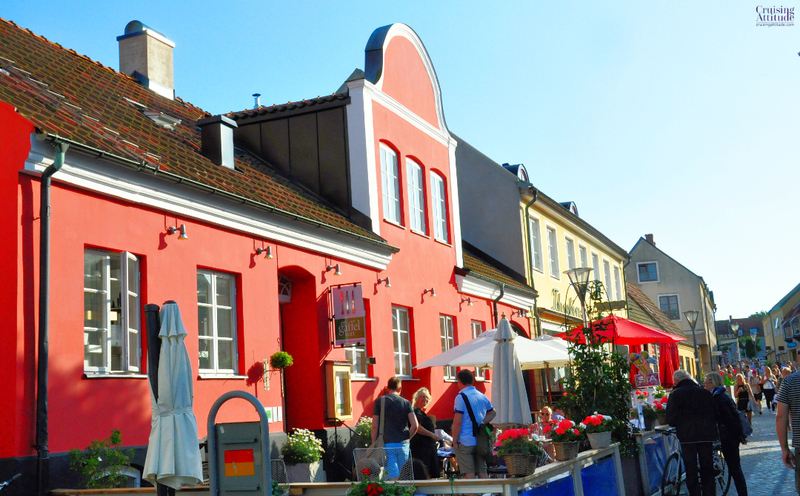 The areas on either side of the pedestrian street are residential and you’ll find colourful one and two-storey townhouses and cobblestone streets. It’s worth a walk with your camera. 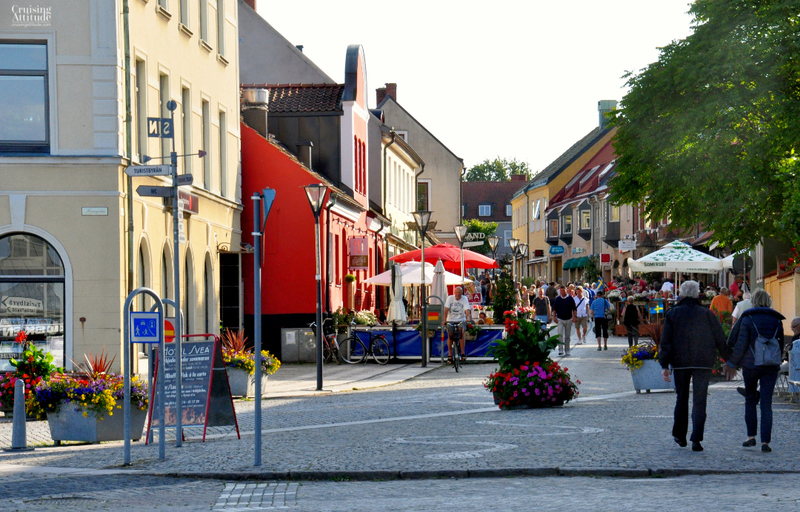 The pedestrian street is lined with restaurants, cafés and ice cream shops. Unfortunately, we arrived too late to get a table. Everyone was out and about on this warm June evening. 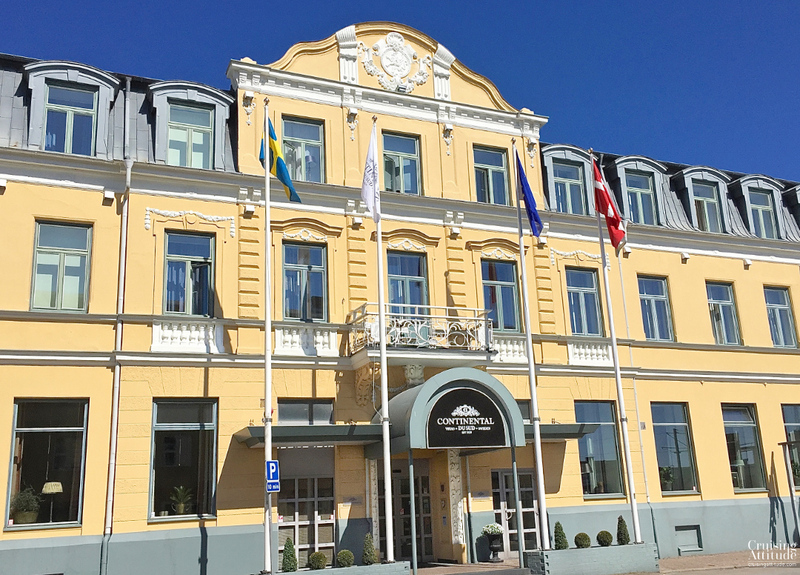 The marina office opens only on appointment (07.00-09.00 and 14.00-16.00). 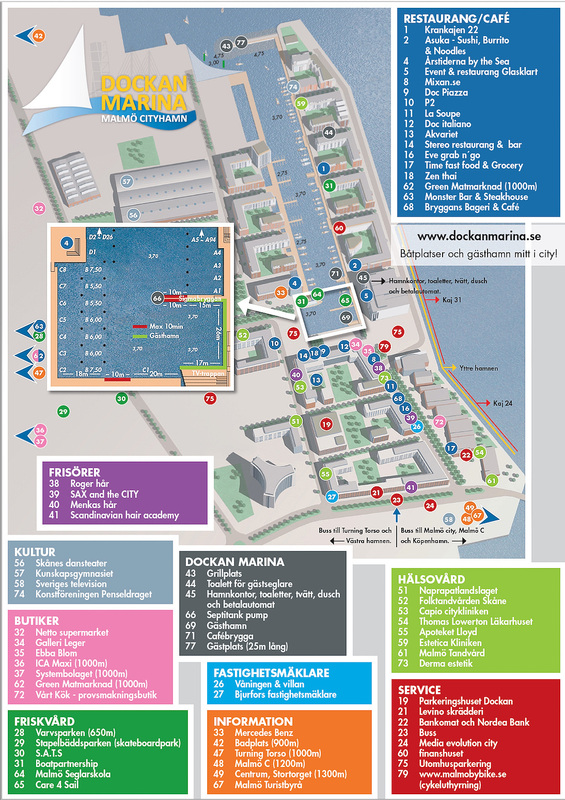 Marina prices (2016): 200 SEK during high season (June, July, August) and 135 SEK during low season. You pay the marina fee at the automat (takes credit cards only). You can also buy a Tallycard smart card for electricity here and “fill it up” . Money on the card that isn’t used will be refunded when you return the card to the machine. It will just swallow the card and give you your cash! Showers and toilets are included in the price. 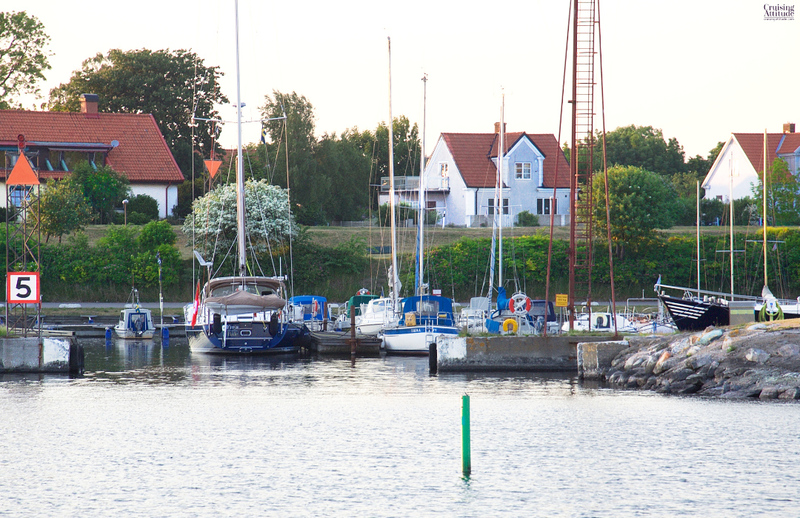 Most sailors who spend the night in Simrishamn will make the traverse over the Bay of Hanö to Utklippan. That’s because they’re in a hurry to work their way up to the east coast archipelago which begins just before the town of Oscarshamn. 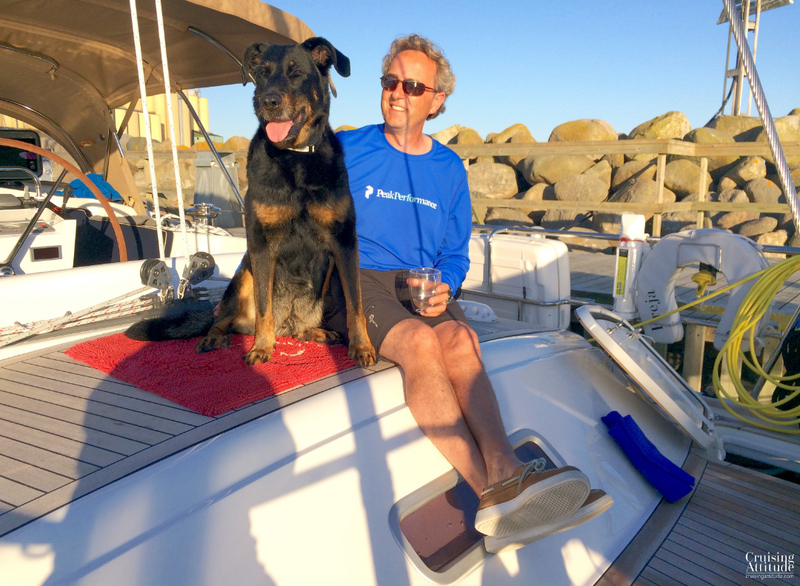 Since we weren’t in a hurry we decided to sail north and explore the coast north of the bay. Our first stop was the small marina at Hellevik. 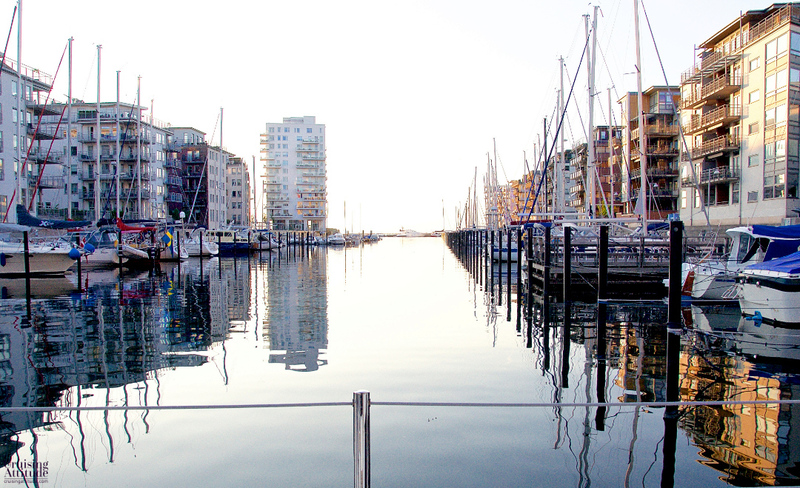 We found this marina in the guide book “Hamn Guiden”, part of the Hamn/Havne Guiden series. The village itself is so small that you don’t even realise there’s a village. There’s the marina and fishing harbour, a few houses, a seafood shop, a restaurant and a combined supermarket-boat supply shop. That’s it! 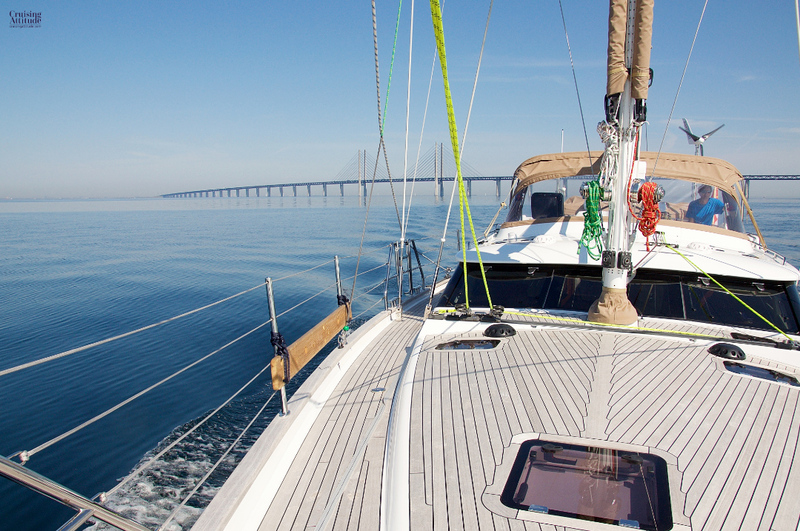 But it was a very pleasant 33 mile sail and set us up to visit the small archipelago of Blekinge. The supermarket/boat supplies shop is next to the marina office. Blekinge is the area located north of the Hanö Bay. Its archipelago isn’t well-know to those who don’t live there. If you have the time, we encourage you to explore it — it’s lovely and not very crowded. 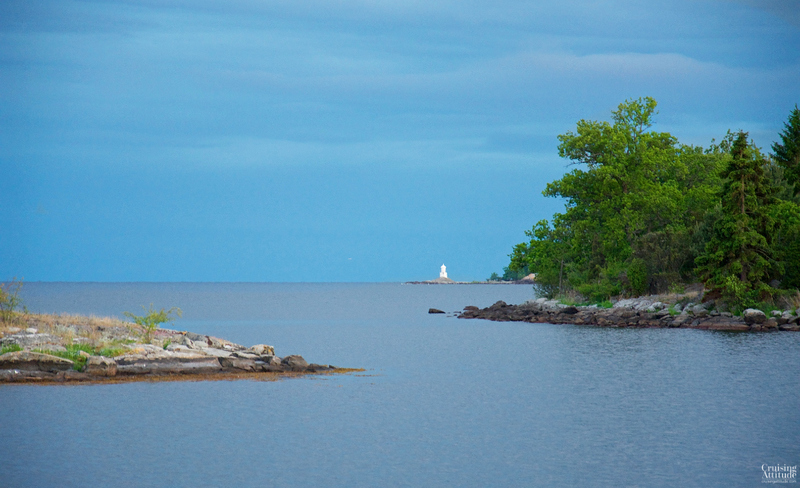 We were really itching for a peaceful anchorage surrounded by forest. The last time were at anchor was south of Gothenburg on the west coast of Sweden. 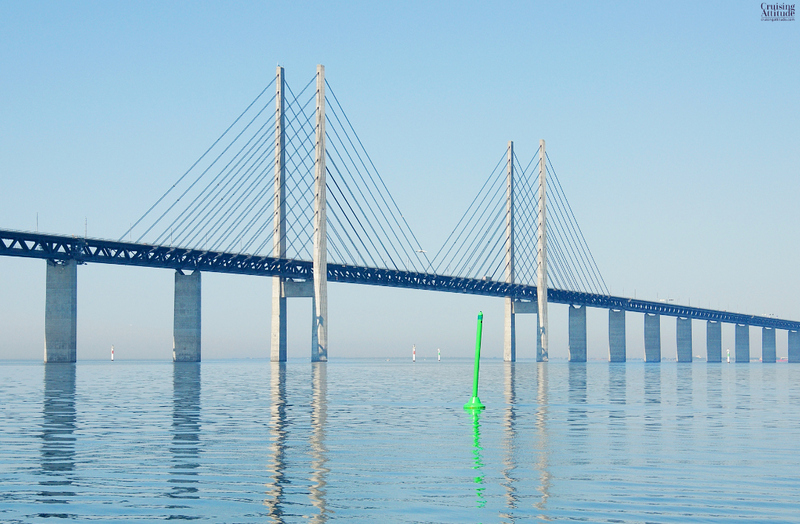 We found it in a well-protected cove called Skönviken (“beautiful bay”) just west of Ronneby — and it is indeed beautiful. We were all alone, since the school holidays had not yet begun. It’s a wonderful anchorage because it’s well-protected but not far from the open sea. You can take your dingy and row/motor over to one of the outer-lying islands to admire the view. 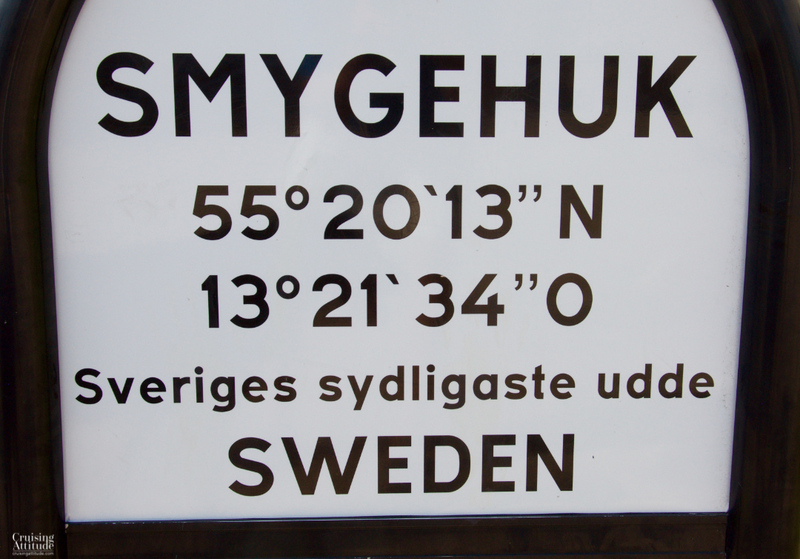 The GPS coordinates for the anchorage are 56°09.48 N, 15°11.23 E. One warning for the Blekinge coast – it’s shallow and rocky. There are underwater rocks everywhere, and when there aren’t rocks there are sandbars. You need to be super-alert while sailing here! You will often find underwater rocks near the entrance to and even inside the marinas. 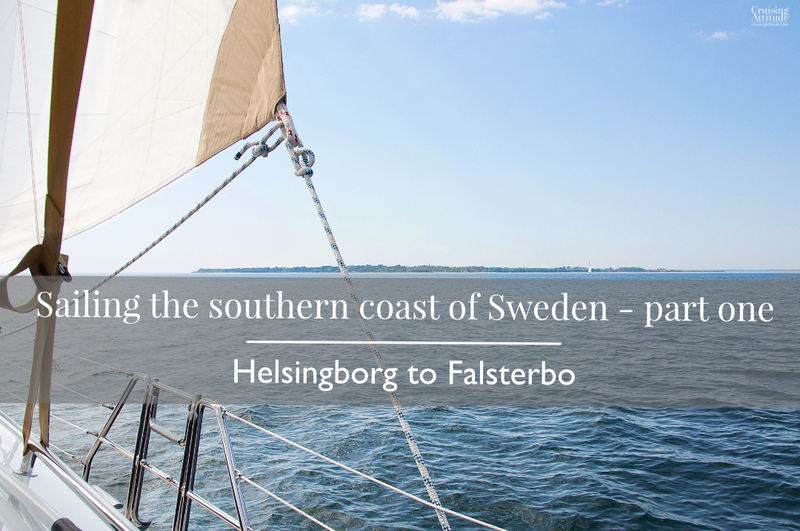 After passing through the 1600 meters of the Falsterbo Canal, you are officially on the south coast of Sweden (still part of the Skåne region). We had to dodge the ferries coming in and out of Trelleborg. 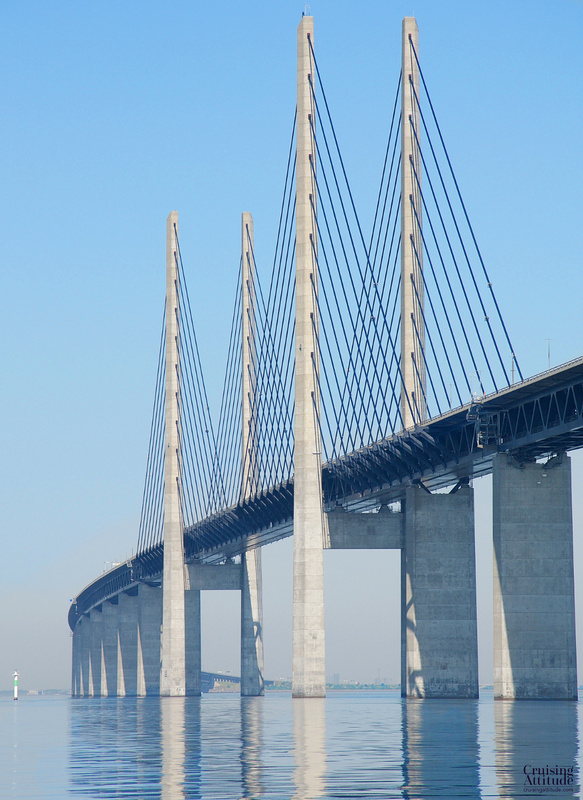 Four difference ferry services connect Trelleborg to Europe: Travemünde, Rostock and Sassnitz in Germany, and one to Swinousjscie in Poland. Quite a few boats to dodge! 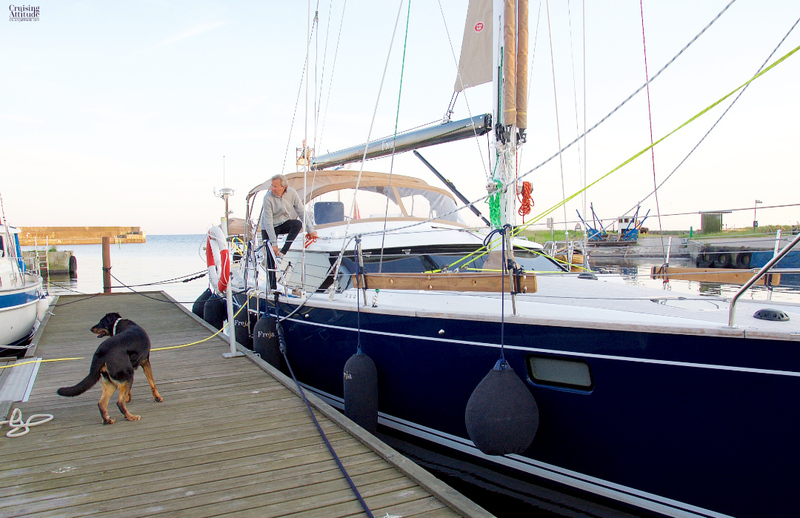 We decided to stay at the idyllic marina at Smygehuk instead of continuing on to Ystad and arriving late. We were thankful we did! It really is charming. 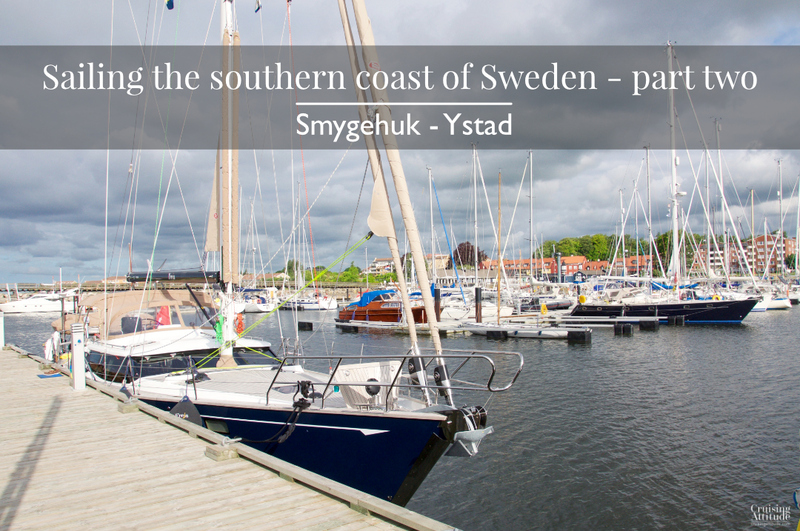 Smygehuk marina is surrounded by little cafés, small boutiques and ice cream shops. A huge white-washed former warehouse houses the tourist office. It’s also an art gallery selling hand-made crafts, sculptures and paintings. During the summer, it also sells ice cream and cakes and coffee. There is also a small shop selling newspapers, snacks, fruit and drinks. 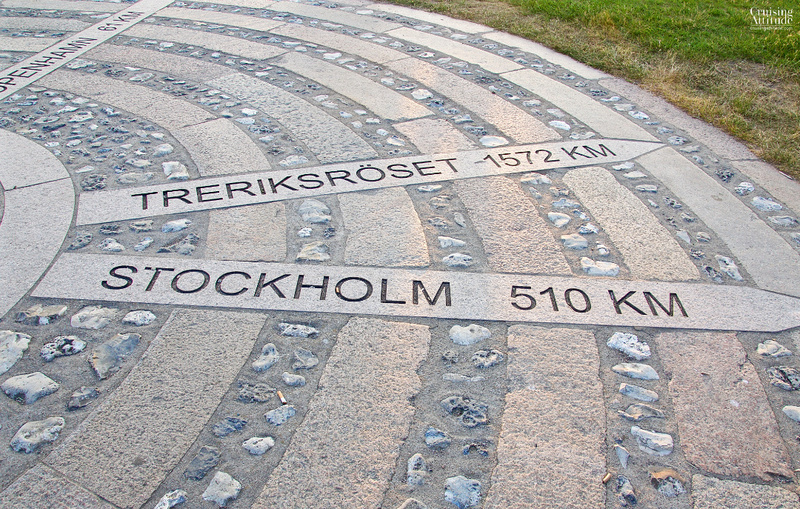 Distances to various capitals as well as to Treriksröset (the point where Sweden, Norway and Finland meet in the north). 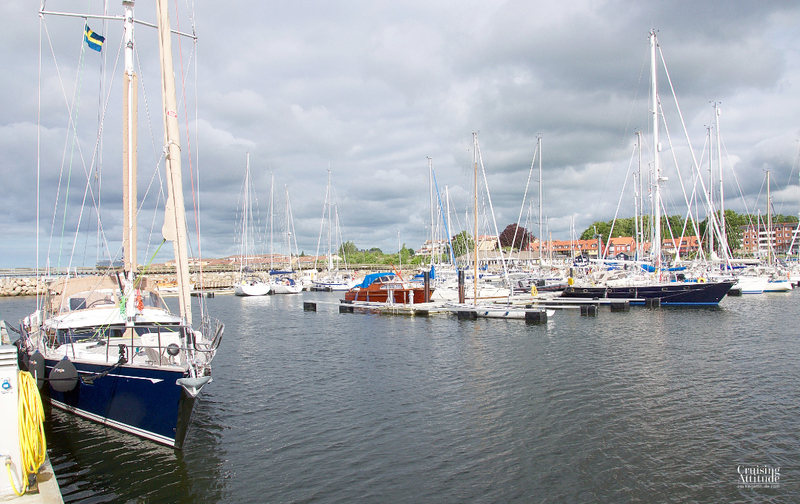 Note: the marina is only 2 meters deep – perhaps less if there’s been a high pressure system for awhile. 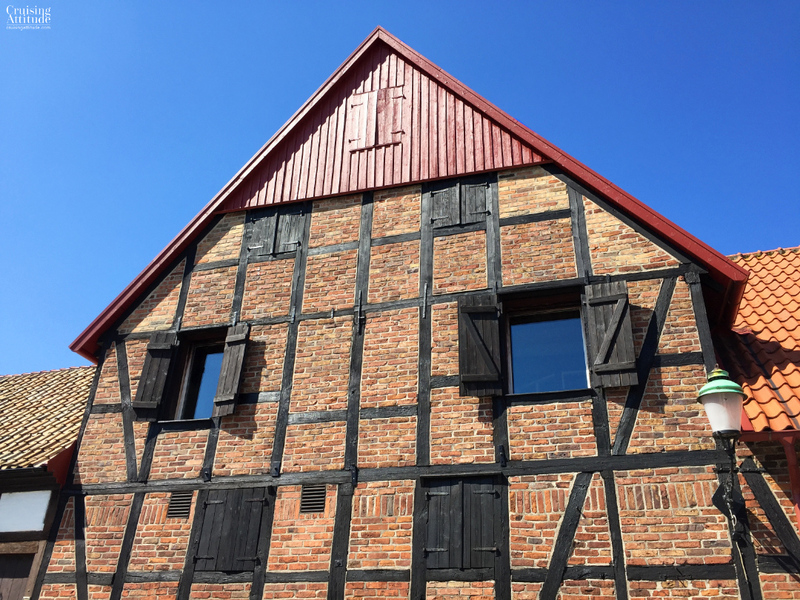 Ystad is not far from Smygehuk and we decided to stop there to visit the city. You need to arrive early if your boat is 43 feet or more in length. Ystad marina just doesn’t have many berths for boat this size. We arrived just before 14.00 and were relegated to a berth in the southwestern part, near the rescue vessels. The advantage of this part of the marina is that the evening sun lasts the longest . 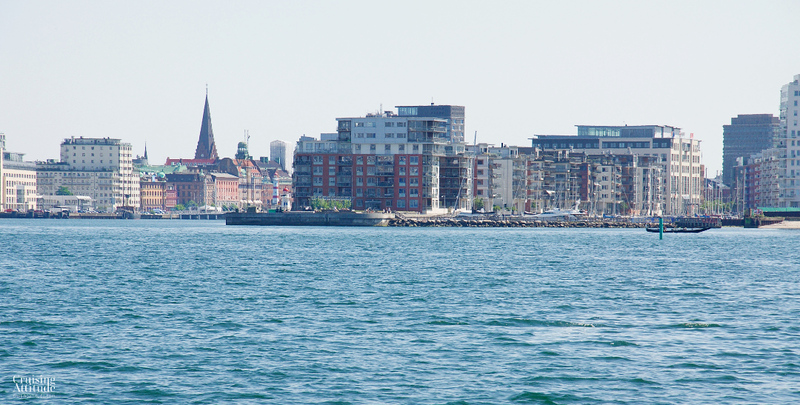 The disadvantage is that the marina office is a long walk from here — we guessed about 500 meters. 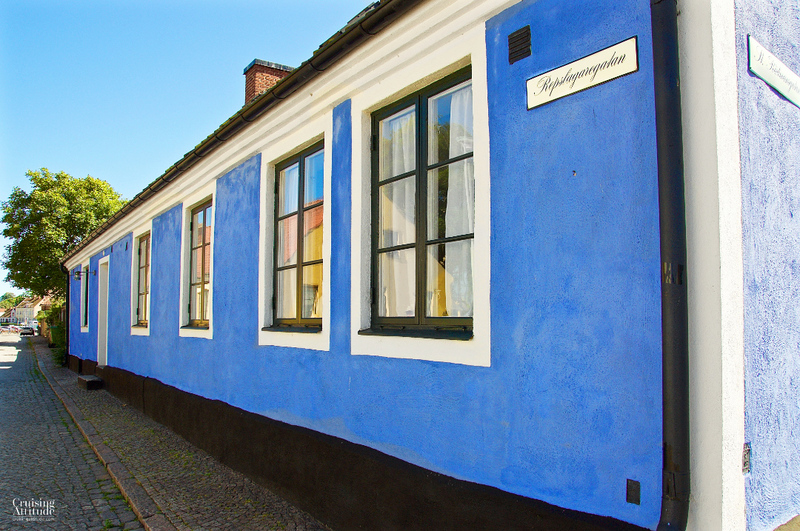 Ystad is an old town, founded as a fishing settlement in the 11th century, and some of the architecture dates from the middle ages. The area between the marina and the town centre is filled with colourful one and two-storey row houses that date from the 1700’s. 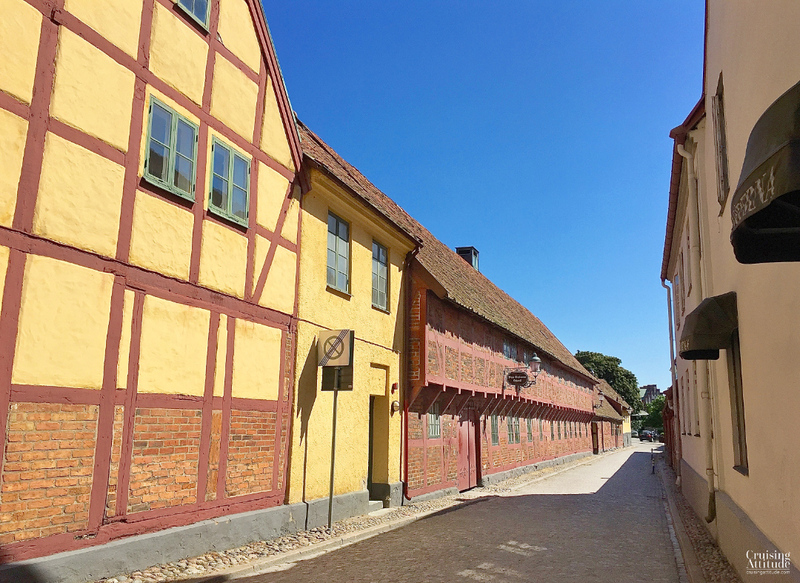 Closer to the centre of town, you’ll find the red brick buildings that date back to when Ystad was part of the Hanseatic League (14th century) as well as the half-timber architecture from the 15th and 16th centuries. 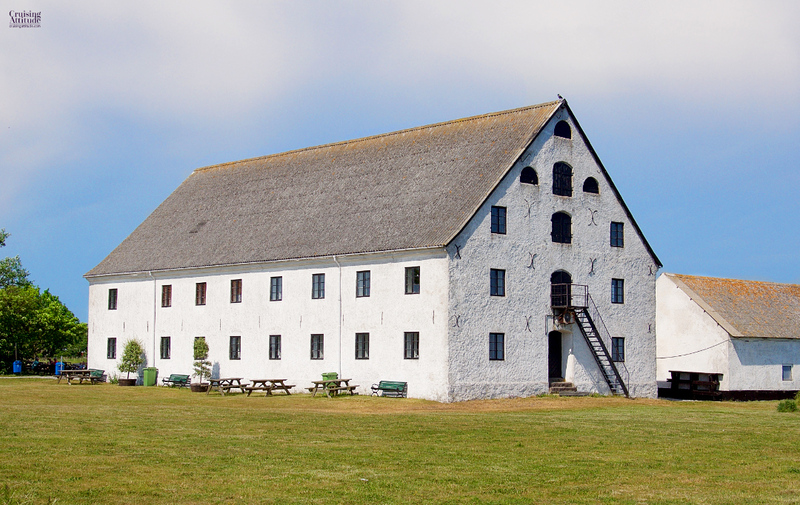 Ystad and its surrounding area has been made famous by the Wallander crime novels written by Henning Mankel. You may have read the books or seen the movies and TV series. I’ve read all the books and have seen the TV series in both Swedish and English. So yes, I’m a big fan of the books! 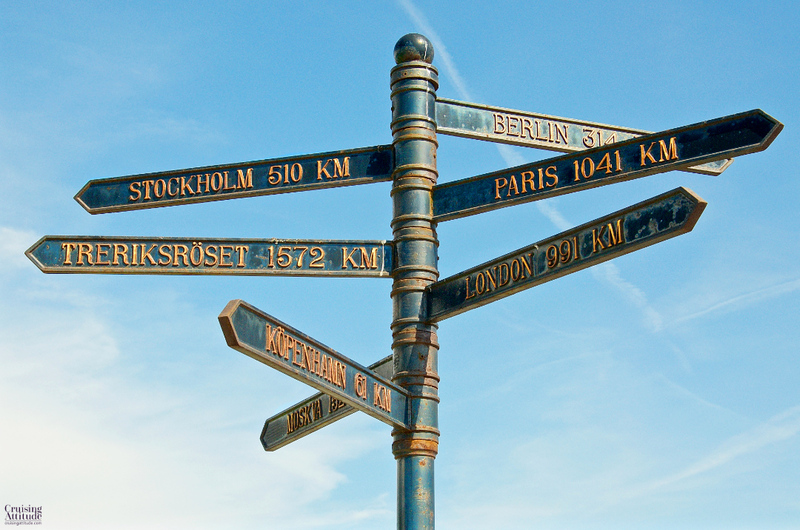 If you’re a fan as well, you can visit the often-named places such as the Hotel Continental. This is where the fictional Kurt Wallander would often have dinner or a drink, and where he once forgot his service weapon. 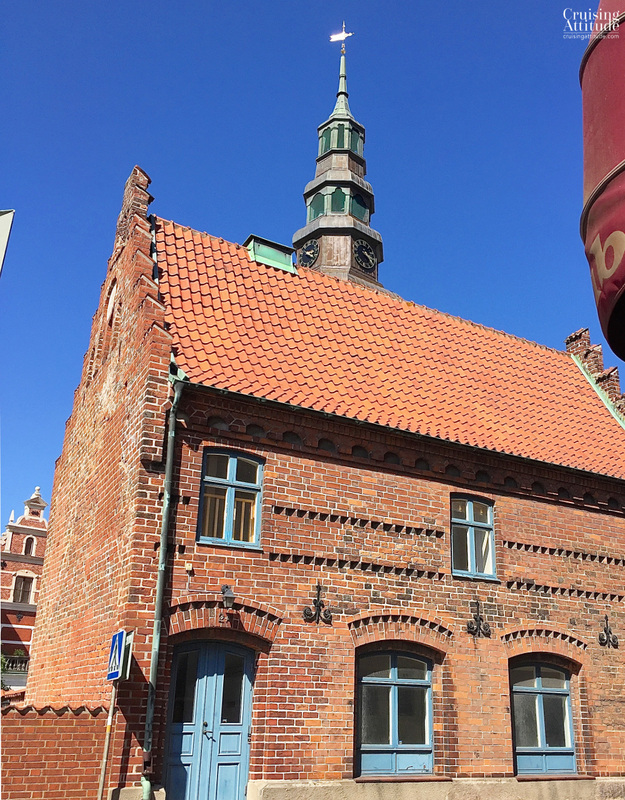 The centre of town is host to lots of shops, cafés and restaurants and we took advantage of this to buy some tea, artisanal honey and other gourmet items at the Gourmet Hörnan. 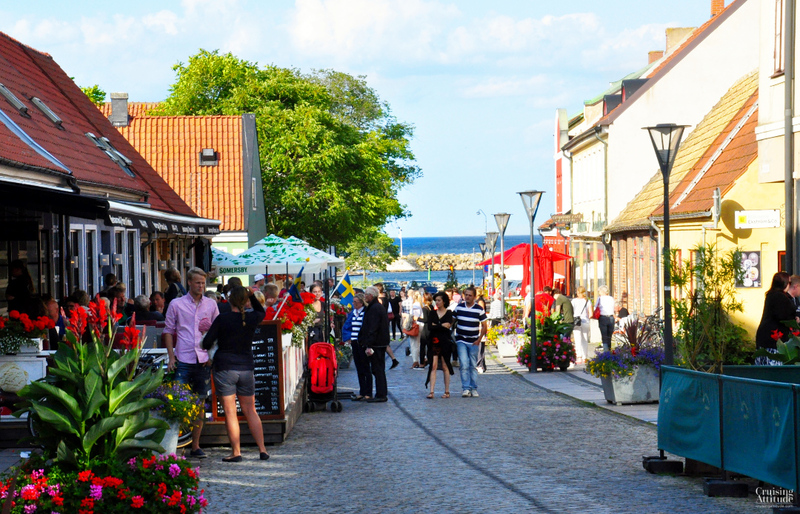 Saturday is the busiest day of the week in Ystad as the marketplace is full of stands selling everything from vegetables to coffee to arts and crafts. 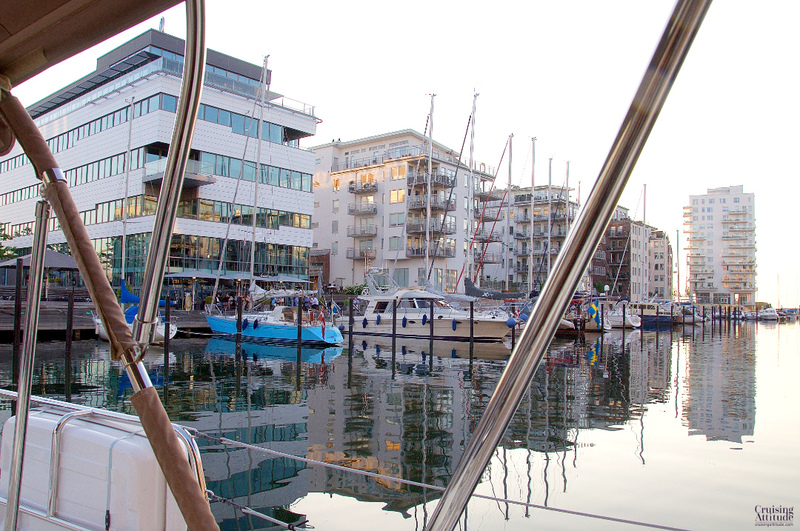 If you’re a fan of seafood, there’s a shop and café just a few steps from the marina office. We bought enough fish to last almost the next week and then sat down at the café to have a seafood lunch with a great view of the beach next to the marina. Electricity is accessed with a Tally Key (smart card that you can fill with cash). Any cash left on the card will be refunded at the marina office when you give back the card. Other facilities: toilets, showers, sauna, washing machines and dryers, grills for picnics, beach, mast crane, fuel station, black water disposal. You’ll find three restaurants right next to the marina. We had lunch and bought some seafood at the restaurant nearest the beach. If you want to have a more “gourmet-style” dinner, try the restaurant at the Ystads Saltsjöbad. We ate a fabulous dinner there. If the weather is cooperative, you can sit outside on the terrace and have a great view of the beach. 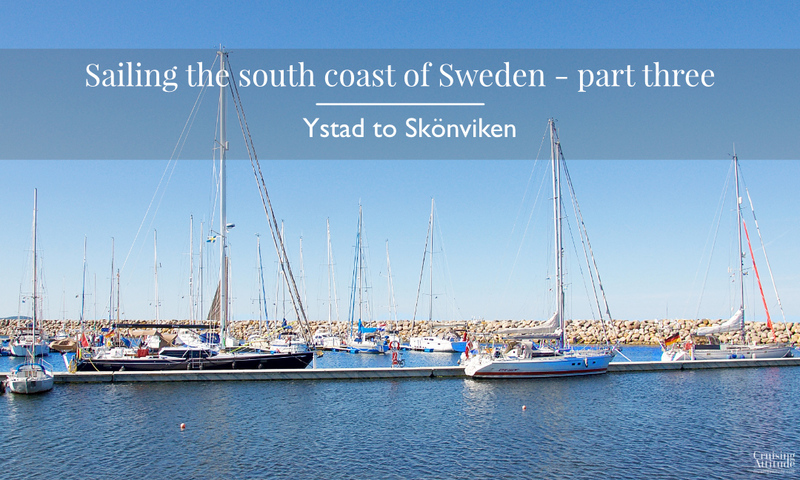 If you have a bicycle, it’s only about a 10-minute bike ride up the coast (west of Ystad Marina). 20.30 in early June, and it’s still 28°C. It’s not just snow and ice in Sweden!